With Christmas and New Year's behind us, we have another fun holiday ahead -Valentine's Day. However, there is another sub-Valentine's Day holiday and it's Galentine's Day. Galentine's Day is the perfect way to tell your OTHER soul mate how much you adore your friendship. 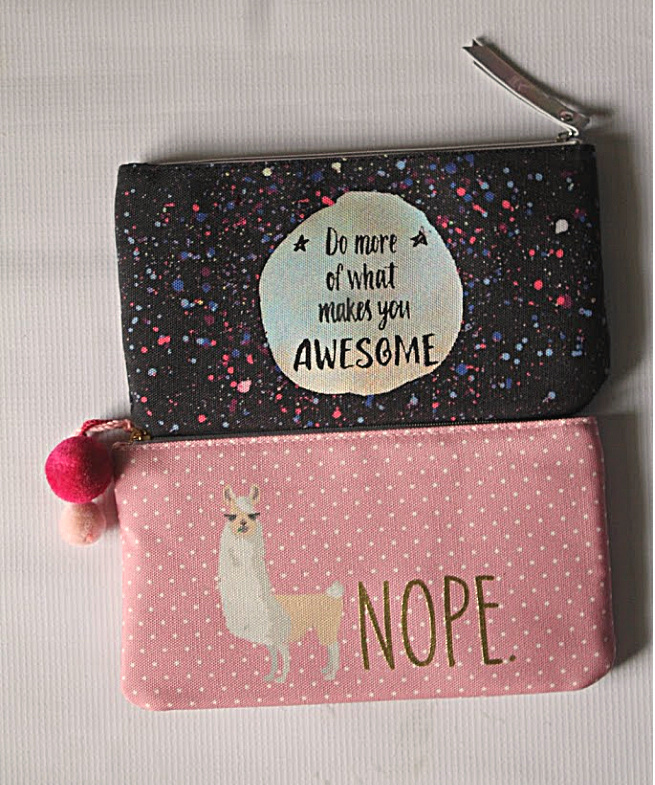 This adorable Galentine's Day gift will certainly bring a smile to any bestie's face. Friendships mean the world to me. Personally, I have never been the kind of person to have a large number of acquaintances but rather a small number of friends that I hold very near and dear to my heart. These friends of mine come a variety of areas of my life- childhood, family, work, school, and neighbors. Each and every one of them is a gem and I love each one for the joy they bring to me. Galentine's Day is an unofficial holiday that started because of an episode of "Parks and Recreation" and has spread far and wide as a day of "ladies recognizing ladies". Sisterhood is important and recognizing our friends with small tokens of appreciation mean everything. Who doesn't love a little extra treat? These NEW HERSHEY® Lava Cake KISSES chocolates at Walmart are the perfect addition to any Valentine's or Galentine's Day gift. 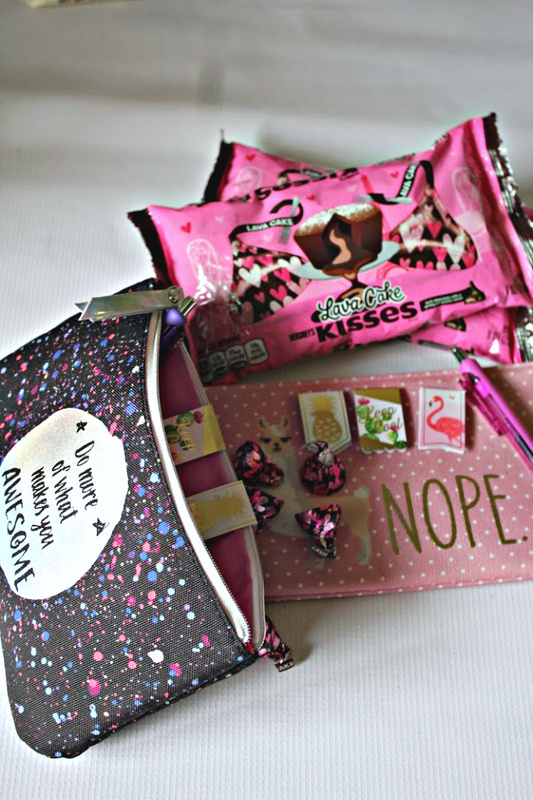 HERSHEY® KISSES chocolates are the ultimate addition to any Valentine's/Galentine's event- a kiss for a kiss! HERSHEY® KISSES chocolates are well known for the signature shape and attention to detail. Iconic, right? Cute metal containers, mason jars, bags, coffee mugs, flower pot- any of these make the perfect holder to personalize or just find a cute one that fits your BFF's personality and fill them with goodies! 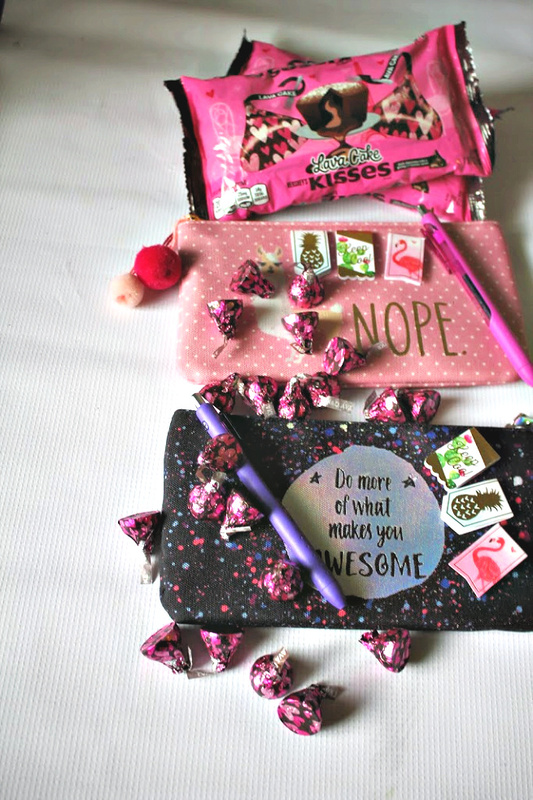 These little bags are fabulous for stationery supplies, makeup, phone, and of course, HERSHEY® Lava Cake KISSES chocolates, which I found at Walmart. You can find everything you need this Valentine’s Day at Walmart - a one-stop shop for all things Valentine’s Day! Goodies and treats are totally different, naturally. Treats = edible and oh so sinful yummies. 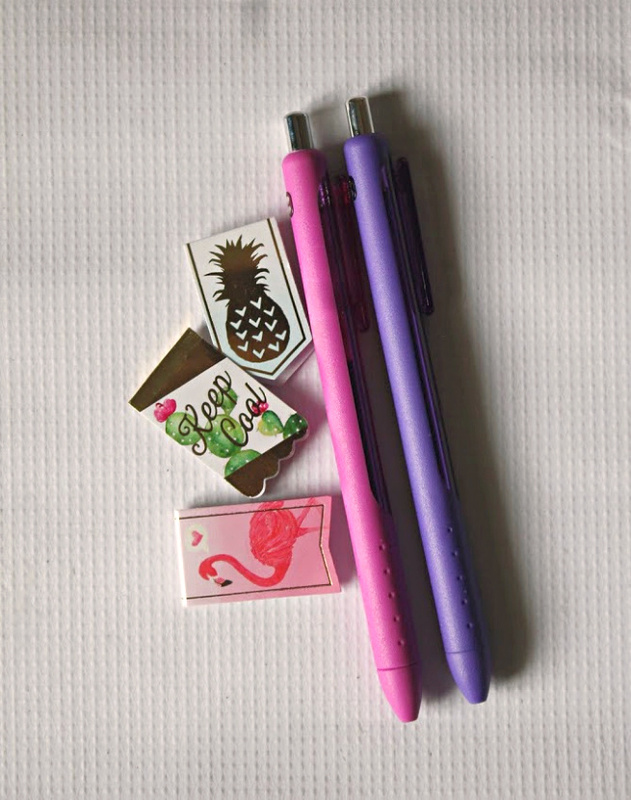 I love to find pens, enamel pens, planner accessories, tea bags, bookmarks, lotions, etc. and just put them all together as part of a fun gift. 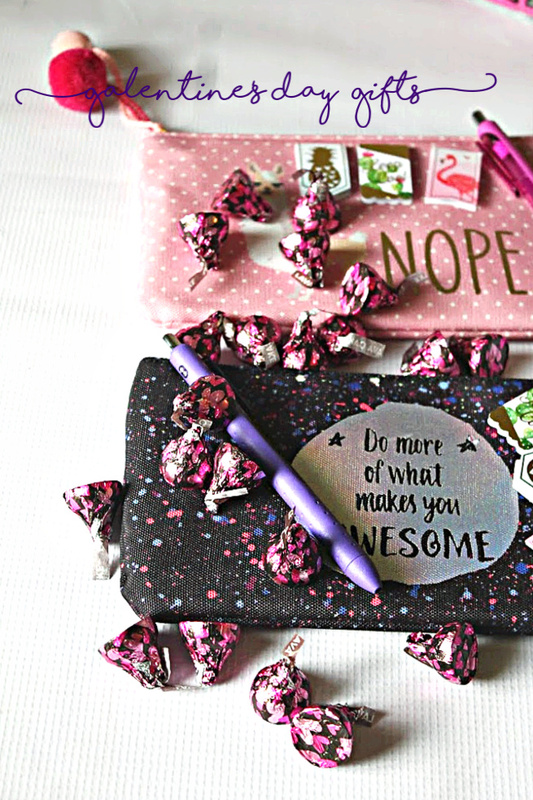 Below- these colored ink pens and magnetic bookmarks are not only beautiful but who wouldn't love them? These don't have to be expensive- $5 gift card to a favorite coffee shop, donut shop, Walmart or wherever will just tie in everything. Place everything inside the holder of choice and deliver to your dearest girlfriends. Celebrate being us being who we are. Give your BFF NEW HERSHEY® Lava Cake KISSES chocolates and cheers to another year of being friends. 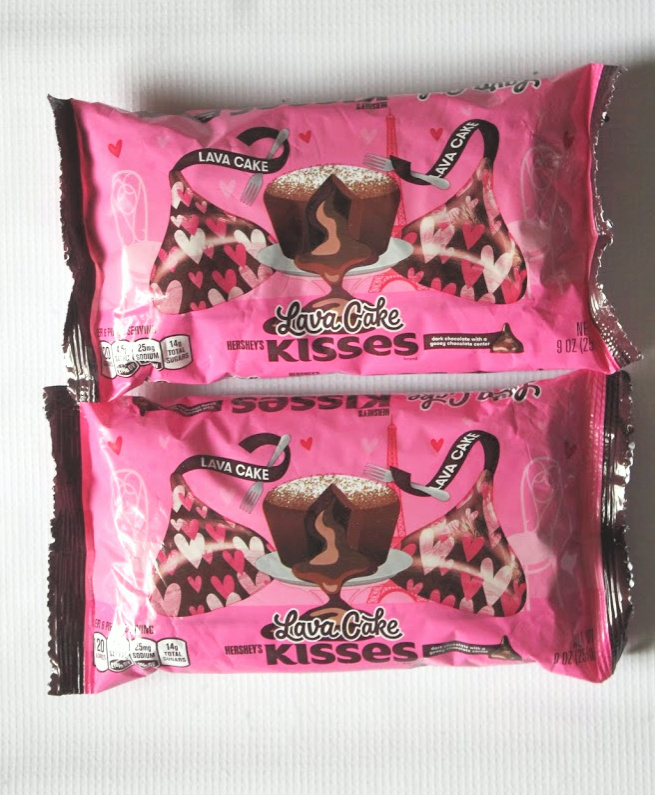 Have you tried the NEW HERSHEY® Lava Cake KISSES chocolates, available at Walmart? Have you created a Galentine's Day Gift for your bestie?